An intrepid former student of The Sixth Form College, Solihull came back into College recently to tell current students of his volunteering work during a Gap year. Ibrahim Rashid, who left the College last summer, delivered a talk on volunteering and engaged citizenship to 1st year Psychology students. He presented to ten different classes on his recent experiences volunteering in Africa. He explained that his volunteering was part-funded by the College in the form of the Terry Kitson bursary. 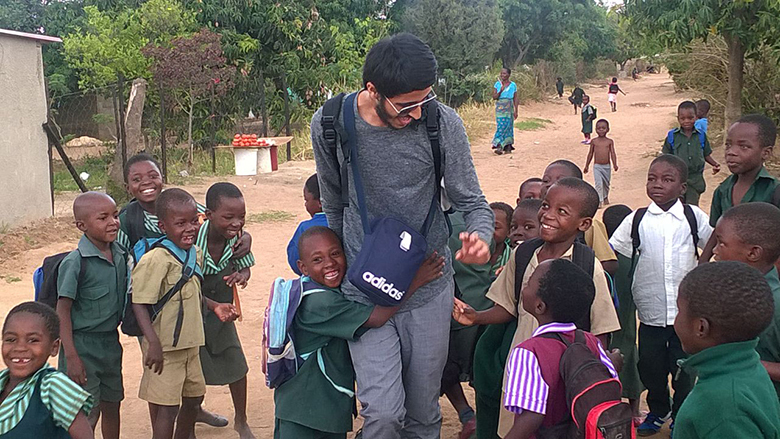 Ibrahim spent the last three months on a volunteering project in Zimbabwe with a charity called ICS (International Citizen Service). ICS is a development programme that brings together young people to volunteer in some of the poorest communities across the world. On this project he delivered sessions with the local schools based on Sexual and Reproductive Health and Rights, as well as livelihoods and life skills. “This was by far the best thing that I have done. It was tough, but extremely rewarding and life changing too. It makes you much more mature, especially if you’re looking to go to university. This is one of the reasons why I decided to take a gap year: it gave me the chance to reflect and look at what I wanted to improve on as a person, and to make me aware of the issues that surround us on a daily basis, both locally and globally. “This project has opened my eyes so much and now I know how lucky I am to have the privileges that I enjoy. I am happy that I spent time helping children in Zimbabwe, as it was great to be able to teach the children topics such as peer pressure, self-awareness and self-esteem, CV writing, as well as health and social issues that affect them, such as HIV and AIDS. The students who heard the talk asked questions about how to get involved with volunteering, the skills he is developing in becoming an Active Citizen and about the process of applying to University.